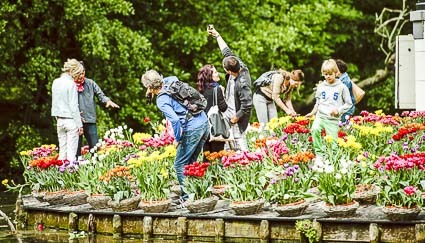 ABOVE: Tourists and locals tiptoe through the flowers on Tulip Island. INSET BELOW: A tour boat near Centraal Station. A succinct and handsomely illustrated roundup of major sights with maps to help you get your bearings. Nancy D. Brown, a travel writer and blogger from California, describes "the best things to see and do in Amsterdam, Holland." If you're stuck at Schiphol Airport for more than a few hours, take the train into the city. History and horror go hand in hand at Amsterdam's creepiest tourist attraction, which is built over a medieval graveyard. If you're traveling with a group, the non-profit ARTTRA organization can arrange customized pedestrian, boat, or bus tours to museums and private collections. Book a professional travel guide online, with a choice of 20 different languages. Rederij Lovers offers a variety of boat trips--among them, sightseeing tours, a circular museum boat route that allows stopovers, an Artis Zoo express boat, and evening cruises with dinner or wine and cheese. Ingrid van Bijnen offers private half- and full-day tours of Holland, using minivans that hold up to six passengers. Dr. Kees Kaldenbach, an art historian who specializes in Vermeer, offers 2�-hour tours that combine a lecture at his home with a guided tour through the Vermeer collection at the Rijksmuseum. Dr. Kaldenbach can also guide you through the Mauritshuis Museum in The Hague. Follow these 10 routes through Amsterdam and its surroundings--but first, read the tips on what kind of cycle to rent. Two young men--one from Canada, the other from the U.S.--offer daily group or private tours by bicycle, along with half- or full-day bike rentals. Tours include the use of a bicycle and, if necessary, rain gear. The most pleasant way to reach Holland's largest collection of windmills is with the excursion boat Nehalennia from Rotterdam, which is an easy trip from Amsterdam by train. Our article has details on how to reach this popular tourist attraction, along with a collection of Web links for Alkmaar. The world's largest flower garden has more than 6,000,000 bulbs, including 1,000 varieties of tulips alone. Holland's once-in-a-decade World's Fair of horticulture will bloom again in 2012.